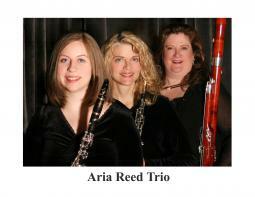 The Aria Reed Trio was formed in 2006 by Crane School of Music faculty members, Anna Hendrickson, Julianne Kirk-Doyle, Carol Cope Lowe. The trio presents recitals and clinics in New York and has been featured on the WXXI radio broadcast in Rochester, New York. The trio enjoys championing new works and has presented commissions at the 2008 and 2010 conferences of the International Double Reed Society. Aria's repertoire includes an array of works from a variety of styles and periods. Education is a crucial part of the mission for the Aria Reed Trio. The ensemble has presented clinics at the New York State Band Directors Conference, Midwest Clinic and New York State School Music Association as well as touring schools in New York State.